Dimitris and I wished to stay in Mumbai for an extra day and celebrate the start of 2014 at the Taj Mahal Palace’s NYE’s Gala, but at the same time, we were eager to continue south and attend the teachings of the HH Dalai Lama in Tibetan settlement in Bylakuppe. Our flight was at 6 am via Chennai. 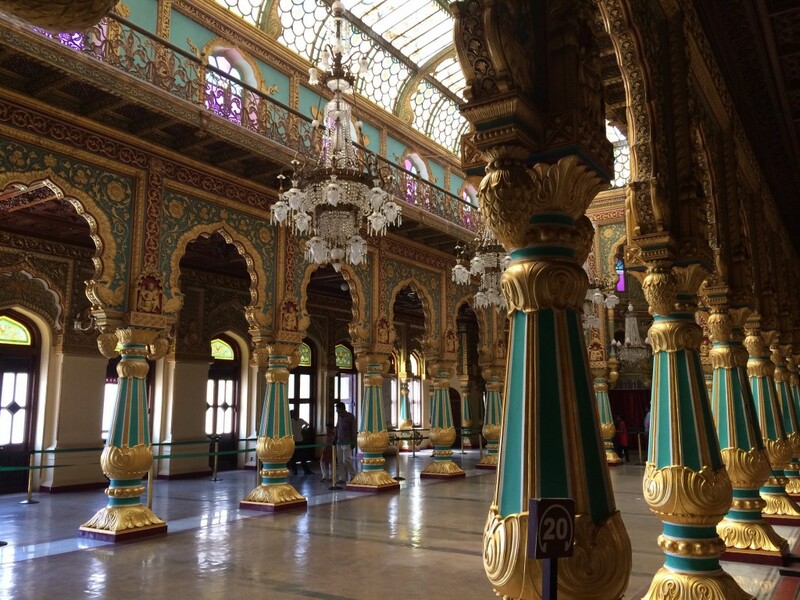 We arrived to Mysore at 11.30 am and hurried to see Amba Vilas (Mysore Palace), before driving to Bylakuppe. The name Mysore is an anglicized version of Mahishuru which means the adobe of Mahisha (Mahishasura), a mythological demon that could assume the form of both human and buffalo. According to a local myth, he ruled the area until he was killed by the goddess Chamundeshwari (Chamundi). For nearly 600 years, from 1399-1947, Mysore served as a capital of Kingdom of Mysore which was ruled by Wodeyar dynasty. Initially, it was a vassal state of the Vijayanagra Empire and with its decline after the Battle of Talikota in 1565, Mysore Kingdom gradually achieved independence and by the time of King Narasaraja Wodeyar in 1637, it had become a sovereign state, except for a brief period in late 18th century during Hyder Ali and Tipu Sultan’s supremacy. We hired a taxi from the airport to take us straight to Kushalnagar (5 kms from Bylakuppe) but before, we wanted to make one stop by what I regard to be one of the most beautiful palaces of India – the Amba Vilas Palace. The Wodeyar kings built first palace in Mysore in the 14th century, it was demolished and constructed multiple times. The present palace’s construction was commissioned to English architect Henry Irwin in 1897, when the old palace was gutted by fire during the King’s daughter’s birthday celebration, and was completed in 1912. The palace stands in the middle of a beautiful, immaculately designed and maintained garden and it is one of the first things you see. 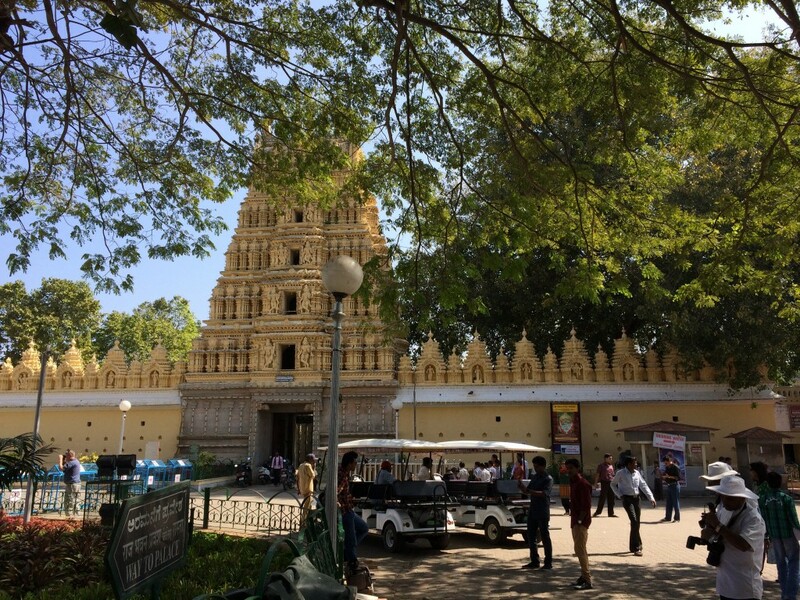 We entered through the main gate and appeared right next to Shweta Varahana Swami Temple, dedicated to Lord Varahaswamy, one of the 10 incarnations of Lord Vishnu. In total, there are 12 Hindu temples at the Palace Complex, oldest of them is dated to the 14th century and the most recent was built in 1953, however, we had a chance to check out only 3 of them. Without a delay, we paid the entrance fee (Rs.200), deposited out shoes and cameras (no photos are allowed inside the palace), picked up our audio-guides, which were very useful, and walked in to explore. 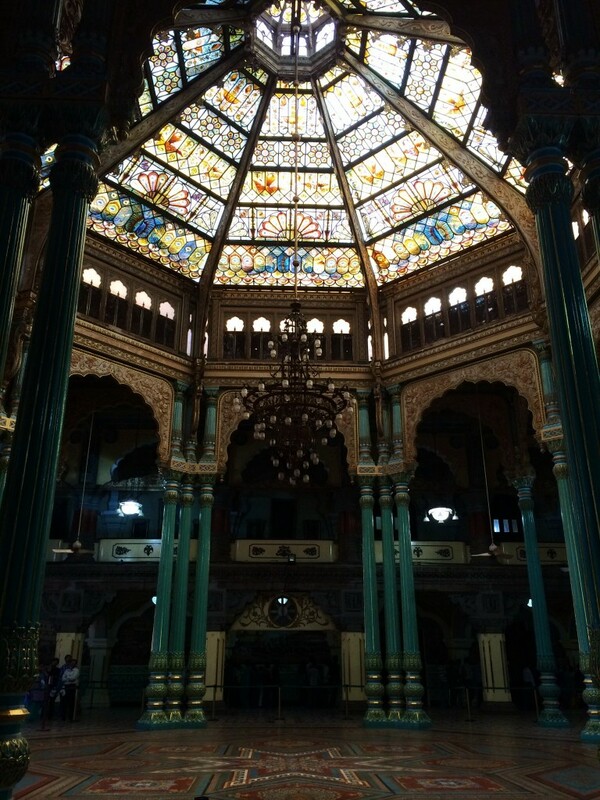 The palace is built in Indo-Saracenic style, which blends together Hindu, Muslim, Rajput and Gothic styles, but the whirlpool of colors, stained glass, mirrors, mosaics, statues, courtyards, royal halls, ivory and wood carvings made me dizzy. I could only compare this palace to the Hermitage in St. Petersburg. We entered the palace via Gombe Thotti (Doll’s pavilion) exhibiting a collection of dolls from the 19th and 20th centuries along with a large collection of Indian and European ceremonial objects (including the Golden Howdah). A beautiful Elephant Gate, decorated on both sides with stuffed heads of real elephants, lead to Kalyana Mantapa or Marriage Pavilion which took our breath away. The octagonal courtyard used to be a wresting arena but now, it is a lavishly decorated hall with Christian, Hindu and Muslim motifs weaved together. The multi-hued stained glass ceiling with peacock design is reflected in a peacock mosaic decorating the floor. The oil paintings decorating the walls and depicting the royal processions of the past, make the space even more splendid. A few chambers with armory and paintings of the former Maharajas connect Kalyana Mantapa with Ambavalisa or Private Durbar Hall. Richly decorated with ivory doorways, stained-glass, steel grills and chandeliers with floral design, Ambavalisa was used by the king for the private audience and is consider to be one of the most beautiful halls in the Palace. The golden throne and the pietra dura mosaic floor embellished with semi-precious stones make it incomparable to any other place in India. The Public Durbar Hall was the last stop in the palace, nicely painted in mellow azure color with exquisite golden decorations and ornate painted ceiling of 10 incarnations of Lord Vishnu, this hall offers the panoramic view of the garden from its, secret and for lady’s use only, balconies. At the exit, we collected our shoes and bags and after sorting some administrative issues (passport pictures and photocopies of the passport for the Dalai Lama teaching), we embarked on another 3 hour car journey (and Rs. 1,300) to Kushalnagar. In 2010, I have spent some time in Tibet and grew very found of Tibetan people, their culture and Tibetan Buddhism in particular. 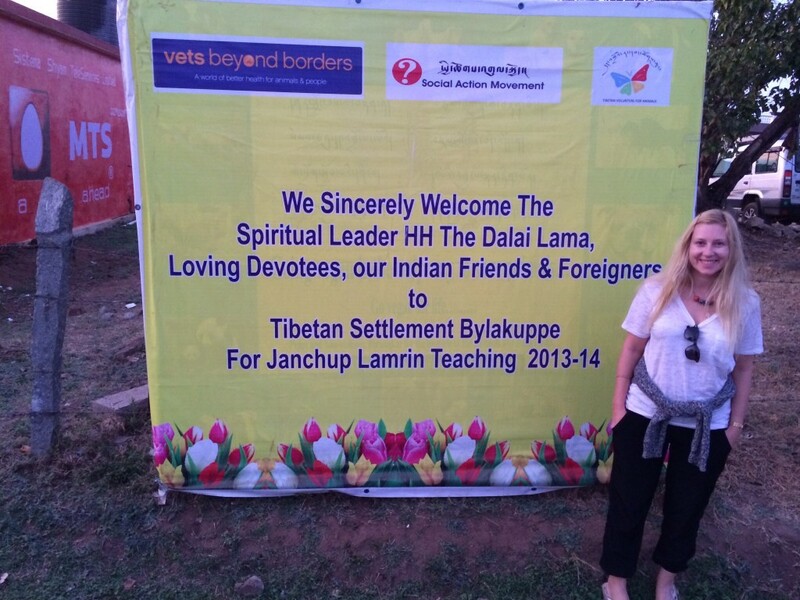 While planning a trip to India, I found out that HH Dalai Lama was giving Janchup Lamrin Teaching in Bylakuppe from December 25-January 3, 2014. 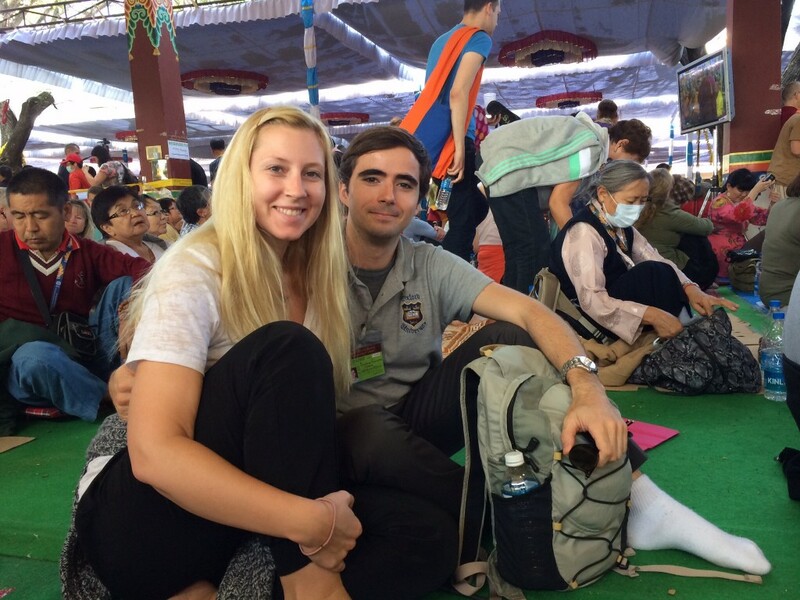 Because of the special legal status of the Tibetan settlements in India, Dimitris and I had to apply for the Protective Area Permits 3 months in advance, in order to attend the teachings and while in Aurangabad, we finally got confirmation that our permits were issued and we were set to go. Obviously, due to a huge influx of monks and other followers of Dalai Lama, we weren’t able to secure a place in Bylakuppe, so we stayed at 4 Seasons homestay in Kushalnagar – a small town 5 kms away. We reached Kushalnagar around 4 pm and instead of going to Bylakuppe to get our IDs in order, we just crashed and slept till late evening. The owner of the homestay came around 8 pm to advise us to go to town and get a dinner before too late, the New Year’s Eve in Kushalnagar didn’t look very promising. We ended up at the Shanthi Bites restaurant at the Castle Hotel, located on a main road, a few minutes walk from our hotel. It was the most delicious Indian food we had so far, and after the dinner, when search for Champagne completely failed, we went back to our room and, without waiting for the clock to ring the change of the year, fell asleep. Sadly, indifferent of location or facilities (wether it is south or north of the country, 5 star hotel or a homestay), you will always wake up suffocating from burning trash. Dimitris and I got up at 7 am unable to breath and exposed to violent vomiting sounds from the room upstairs. I guess only us had a quiet night in. We took a tuk-tuk to Bylakuppe, but the driver not only reaped us off, but also dropped us in a wrong place. We had to re-hire another tuk-tuk to drive us to the place where the teachings took place. 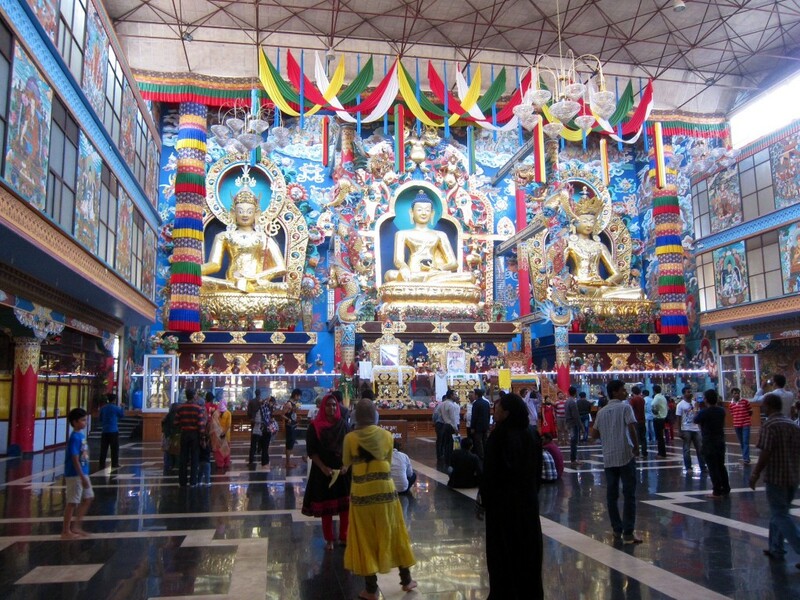 Bylakuppe is one of the first refugee camps set up in South India to host thousands of Tibetans who fled Tibet after Chinese invasion in 1959. 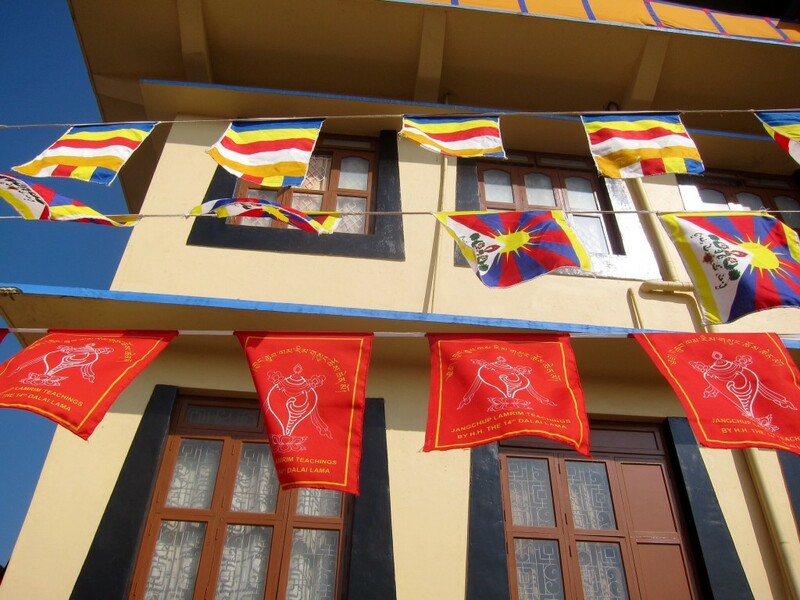 More than 10,000 Tibetans (including some 3,300 monks) call it home right now and one of my closest Tibetan friends from the US, Namgyal, was also born and brought up here. I was really looking forward to visiting this place. After arranging the permits and getting our ID cards, we went to a small market to purchase radios for the synchronized translation. Bylakuppe looked nothing like India we have seen so far – lack of rubbish on the streets and burning trash almost shocked us. People were friendly and polite and except for a few Hindu beggars, it looked paradise-like to us. We weren’t stalked by mobs of Indian men trying to take pictures of us, we weren’t demanded money by uncountable beggars, we were completely left alone to enjoy the peace and calmness of this amazing place. 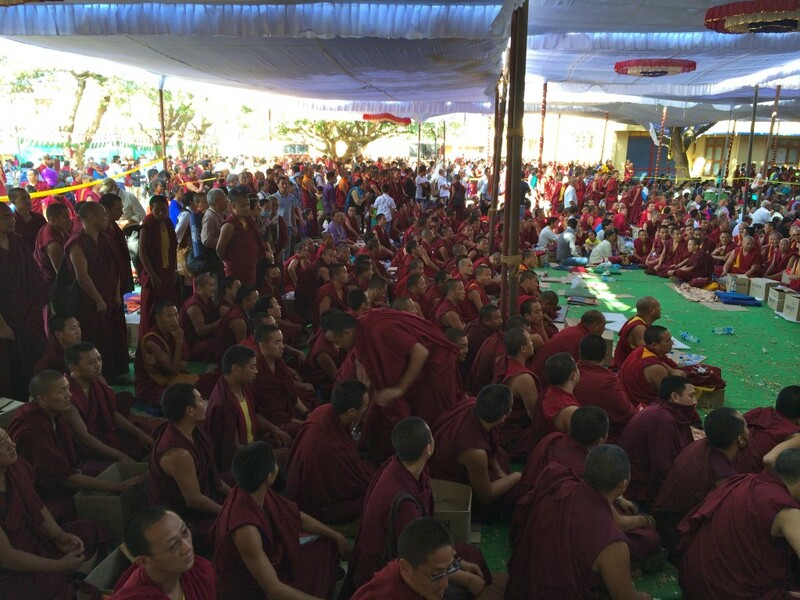 We arrived at the Sera Jey Monastery‘s teaching hall during the longevity prayer for Dalai Lama and after lunch (which was served by monks to all attendees) HH continued the teaching of sutras. The teaching started on December 25, so it was far in progress when we joined, but no matter what, it felt special and holy for us to be there, among all other foreign people who traveled to attend, among the monks from all over the world and of course, because of Dalai Lama’s presence. The lay out of the teaching hall was smartly organized into deferent parts, so that the monks would sit according to their ranks in one section and foreigners and other attendees would be in the language sections they belong to, though we sat wherever we saw a space because foreigners’ section was full of people. The teaching ended around 3.30 pm and we had time to browse around the village and visit the Temples. The village itself looked very organized and tidy, with a lot of schools and other public facilities. Dimitris and I visited a monastery within the village. 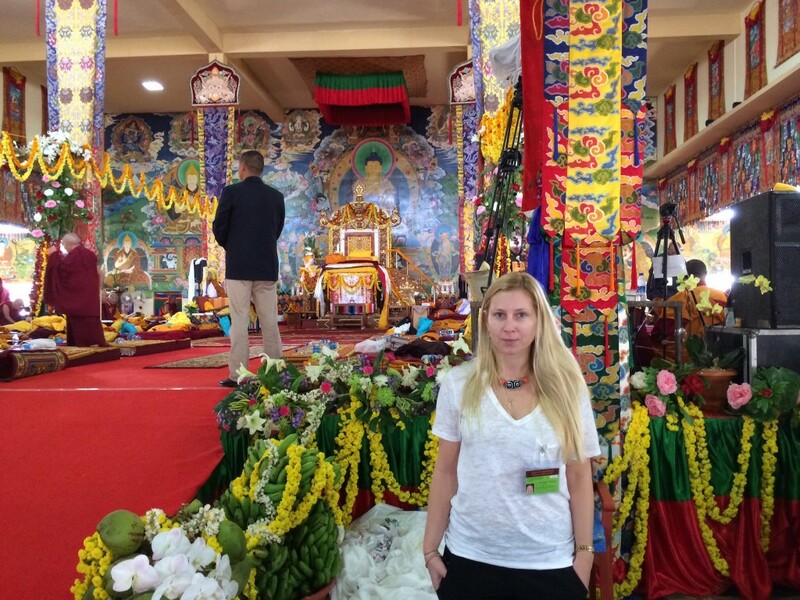 The moment I walked in, it immediately felt like being back to Tibet – the same rows of praying seats, the same Tangkas on the columns and even similar wall paintings. I offered a white scarf (khata) to the Buddha and made a donation, just as i did in Sera Monastery outside of Lhasa a few years ago. 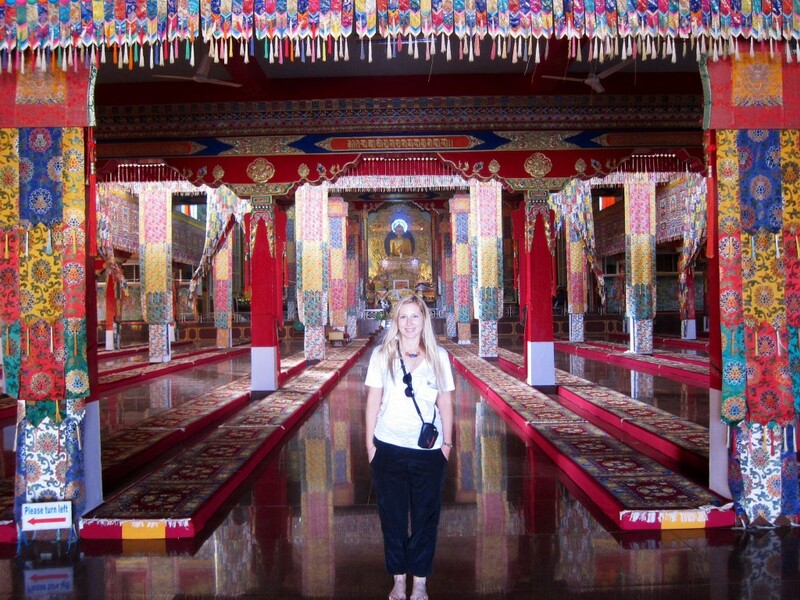 After, we took a tuk-tuk to the Namdroling Monastery, home to the spectacular Golden Temple presided over by three 18 m high gold plated Buddha statues. The monastery was closing for the visitors at 5 pm, so we had a very short time to browse around, pay our tribute and leave, but not before getting into an argument with an Indian person who hid my shoes (which i took off before entering the monastery) in order to extort money from me. I would have smacked the guy, have I not been in a holy Buddhist place. We drove back to Kushalnagar and had our dinner at Planter’s Inn, a place highly recommended by the ICICI bank people, Airtel booth owner and a pharmacist. It indeed, had a spirit of Planter’s Inn but unfortunately, it was empty and a bit chilly on the terrace where we sat. Upon return to the hotel/homestay, we got into another back-and-forth texting battle with an owner, a young lady who was the most difficult person to deal with. She would not prodive us the wi-fi password (even for a fee) because she was afraid neighbors would steal it, she also wouldn’t do this or that and her list was endless. I don’t think people like her should own or manage hotels/homestays because she had hospitality level equal to -100. Sadly, because the hotel was very comfortable and conveniently located a few minutes away from the main road, so it was quiet at night and close to all the “actions” Kishalnagar had to offer. In the morning, we drove back to the teaching (Rs. 100) and I was lucky to tune-in to the Russian synchronized translation of the teaching because it was more cohesive than the English one. Dalai Lama was reading and explaining sutras about prayers (for the animal and people, for the god), also about 4 miserable stages of life: birth, sickness, aging and death. Dimitris was working on his laptop and i, besides listening to Dalai Lama, observed the people in our foreign section. Many of them were European or Asian monks, many were Dalai Lama followers (quite a large Russian group as well) but almost all of them were taking notes or typing something on their iPads or laptops. Dalai Lama took a lunch break around noon, so we walked out, had some street food to eat and chatted with a monk from Dharmasala. The teachings resumed after the break and second part of the day was devoted solely to Monk Debates. It is an interesting scene when one monk is questioned by other monks about specific term, interpretation or opinion. It is believed that the true Buddhist knowledge is born in the debates, when everyone has a right to express himself and find the truth collectively through continuous questioning. I have witnessed the same debates at Sera Monastery in Tibet. Because all the debates were in Tibetan and no translation was provided for that part of the teaching, we decided to go back to Kushalnagar, have an early dinner at Shanthi Bites and pack. Dimitris and I left Kushalnagar at 8 am, we hired a car to take us to Bangalore (Rs. 4,300) because we had two flights to catch – one to Jaipur for me, and to Delhi for Dimitris. It was a long 6 hour drive and despite the fact that our car broke in the middle of the road in Bangalore, we made it to the airport on time. Dimitri’s time in India came to an end. I guess all the bad things associated with India (unaccountable beggars and urinating men, elaborate extortions, thieves, unimaginable amount of garbage on the streets, continuous bargaining and arguing with people trying to sell us everything and anything, along with creepy men stalking us to take our photos) didn’t make his trip enjoyable. He was going back to New York, and I was continuing to Rajasthan, for another 3, turned out to be, adventurous and eventful weeks. 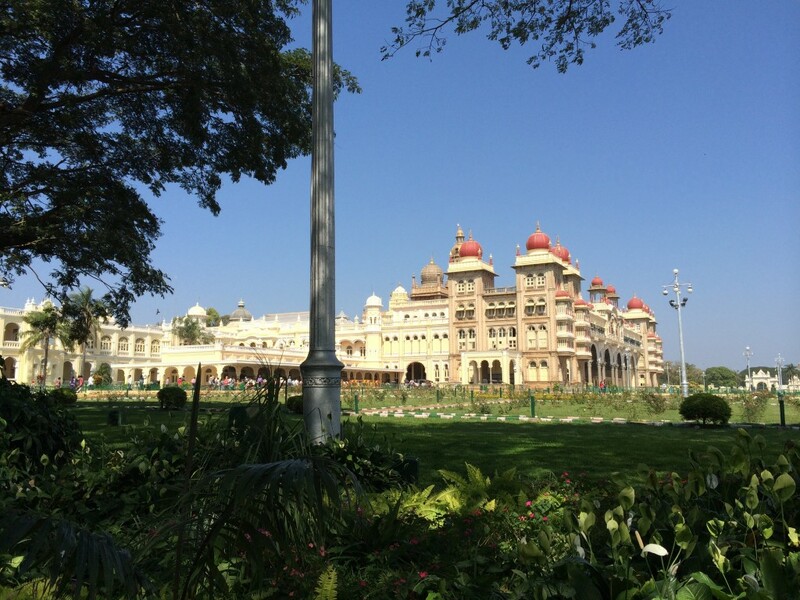 This entry was posted in Asia and tagged 4 Seasons Homestay, Amba Vilas Palace, Bangalore, Battle of Chamdo, Battle of Talikota, beggars, burning trash, Bylakuppe, Chinese invasion, Dalai Lama, Dharmasala, Henry Irwin, India, khata, Kingdom of Mysore, Kushalnagar, Mahisha, monk, monk debates, Mysore, Mysore Palace, Namdroling Monastery, Narasaraja Wodeyar, Planter's Inn, Rajasthan, Sera Jay Monastery, Sera Monastery, Shanthi Bites, Shweta Varahaswamy Temple, tangka, Tibet, Tibetan Buddhism, Tibetan people, Tibetan Settlement, Wodeyar. Bookmark the permalink. ← Mumbai, India. December 2013.